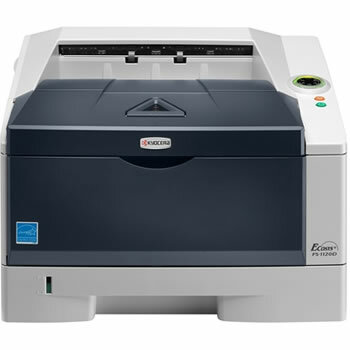 For the price of many entry-level laser printers, the Kyocera FS-1120D offers features usually found in more expensive models. Having enhanced resolution of 1800 x 600 dpi, a duplexer, and print speeds up to 32 pages per minute, the FS-1120D’s also has expansion for memory and paper capacity with a network option to be a serious printer for any department or classroom. Only weighing less than 27 pounds, the Kyocera FS-1120D’s 14¾” x 15½” footprint is slightly larger than the legal-size paper its cassette tray can completely hold. A 10½” height allows the printer to have enough clearance sitting on a desk with an overhanging shelf. The FS-1120D prints fast. It does take almost 20 seconds for the printer to warm up from a cold boot, but once it’s up this laser starts chugging letter-size prints at 32 single-sided pages per minute. There’s an additional 6-second delay between print jobs and high-resolution printing, but its speed is comparable to many mid-range printers costing much more. The duplexer, normally a separate item, comes standard and prints up to speeds of 18 ppm. The FS-1120D comes with a 250-sheet cassette tray, capable of holding an entire ream of letter or legal-size paper. The flip-door reveals a 50-sheet multi-purpose tray that can handle transparencies, labels, post cards, envelopes, 3” x 5” postcards up to 8½” x 14” legal paper, of bond weights up to 110-pound cardstock. A second cassette can be easily attached to increase capacity to a total of 550 sheets. The native 600 x 600 dpi resolution can be enhanced using “Fast 1200 mode” to produce 1800 x 600 dpi resolution. At maximum resolution, the FS-1120D keeps graphics and text sharp--even at 6-point font size. To keep from consuming too much toner, the printer has a 300 dpi and 600 dpi resolutions. Understanding the printing needs of today’s businesses in providing support for the major software applications, Kyocera has installed a full set for print emulators that should satisfy the most diverse office. Emulators include PostScript3, HP PCL6, and Kyocera’s own KPDL3. 125 scalable fonts and barcodes are available on a separate CF flash memory card. The control panel on the Kyocera is unique from other manufacturers. It uses a dial-like indicator to quickly and easily tell you status and problems with green and amber “light arcs”. A “Cancel” and “Go” button complete the control panel’s design. The “Go” button also doubles for printing out the operation and service status pages, depending on how long you hold the button down. This laser printer packs 32MB of memory. The FS-1120D can easily handle any size print job. An additional DIMM RAM slot is available to expand printer memory up to a whopping 512MB. Add the Ethernet 10/100 Base TX interface option, and the Kyocera can support networked computers in an office, department, or a computer lab. While many printer companies provide a CD with software extras only for Wintel machines, Kyocera’s application software fully supports Mac OS X, as well as the latest versions of Windows. Drivers are also available for UNIX, Linux, and 64-bit Windows operating systems. For the environmentally-minded who want to leave a small carbon footprint behind, the FS-1120D is part of Kyocera’s ECOSYS line. In addition to being Energy Star compliant in decreasing power usage by 60%, the consumable items of the ECOSYS line are designed for longer life using fewer parts and materials. 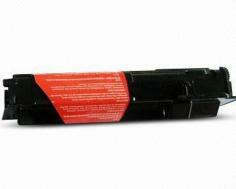 Unlike traditional toners, an ECOSYS toner cartridge is comprised of just five parts and only two materials. The printer produces 54dB of sound printing, idling at 30 dB. To give you an idea of what that means: 60 decibels is the level of typical conversations and 30 decibels is a quiet office. You probably don’t want to have this printer in a conference room chugging 100 pages when a meeting is in progress. But if placed in the copy room or in the middle of a busy office floor, the noise is barely discernable. 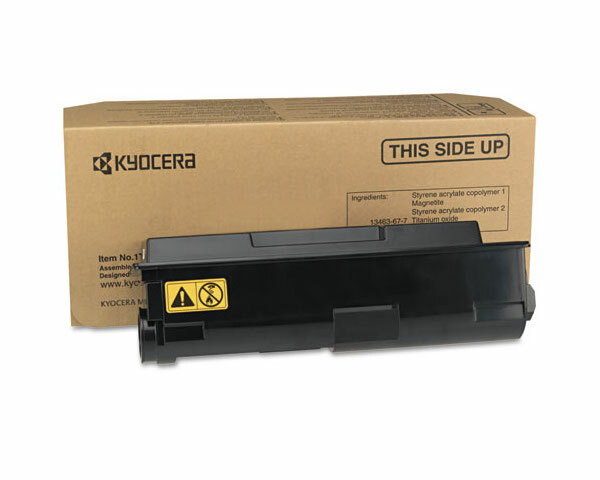 With all the horsepower and extras the FS1120D has, Kyocera still only gives you a toner cartridge less than half-filled with toner. Other manufactures tend to have “starter toner” with their entry-level laser printers as well, but many of those don’t have the speed and resolution of the FS1120D. When you buy this printer make sure to also invest in a full toner cassette. Review it: "Kyocera Mita FS-1120D "
The FS-1120D’s toner and drum are integrated in a single cartridge, making it easy to maintain. Right out the box, the printer comes with a 1,000 page “starter cartridge”. If you are someone who goes through a ream of paper a week, get the standard 2,500-page toner when you get this printer. Those toner yield numbers are based on the always asterisked “5% ink coverage per page”. To give you an idea of what that mean’s: a standard business letter uses 5% ink coverage; a newsletter, 30%; and a page with graphics, text, and photos can exceed 60%.